aiT is available as an integral part of the SCADE Suite, the market-leading mission and safety-critical embedded soft­ware devel­opment environ­ment from Esterel Technologies. SCADE provides a full suite of Model-Based Design (MBD) tools from formal graphical design capture and validation down to embedded C code generation for mission and safety-critical pro­duction use. 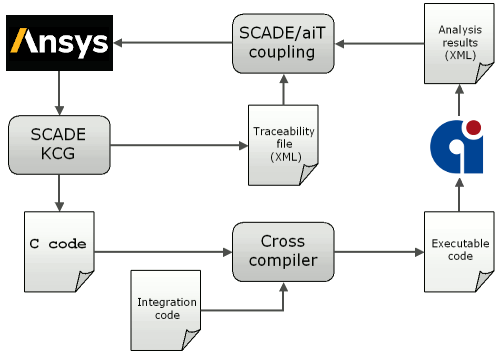 Thanks to the integration of aiT and StackAnalyzer, SCADE is the first embedded-software development environment worldwide to feature WCET analysis and stack usage analysis at the model level. Within the Suite, the tools are called Timing and Stack Verifiers. The automated flow between SCADE and aiT provides for a seamless integration into the de­velopment cycle. 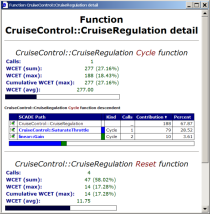 SCADE includes customizable report generation and “diff” capabilities that enable you, at the click of a button, to assess the performance impact of code generation and compilation options on each and every design element. The currently supported processor targets for WCET analysis are MPC55xx, MPC555, MPC565, MPC603e, and MPC755s. For stack analysis, all PowerPCs are supported. If you have questions about other targets, or any questions at all, contact info@absint.com.